This Roasted Squash Salad with Marinated Chickpeas is the kind of salad you’re still thinking about days after eating it. This gorgeous salad is bursting with flavours and textures and it’s packed with nutrition. 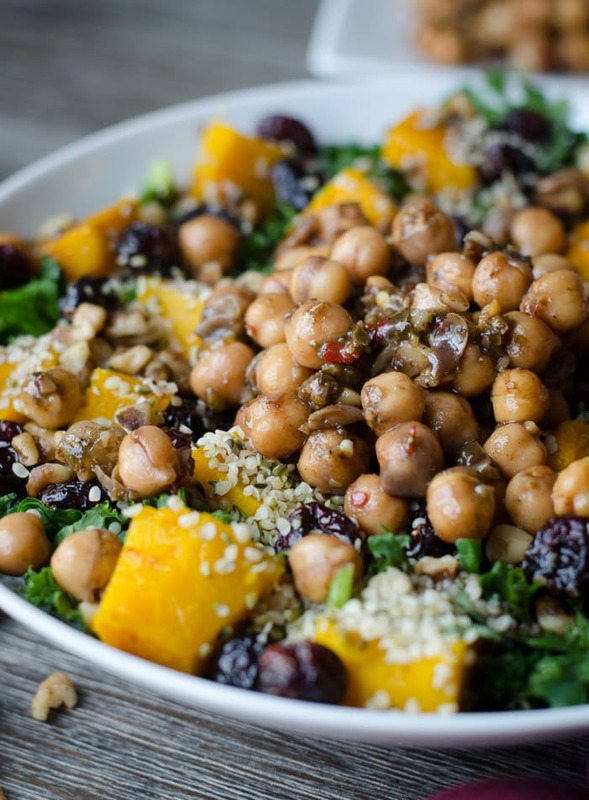 The warm roasted squash is complemented by a tangy balsamic vinaigrette, massaged kale, crunchy walnuts, soft and chewy cranberries and hemp seeds, and the marinated chickpeas come in to make it a meal. 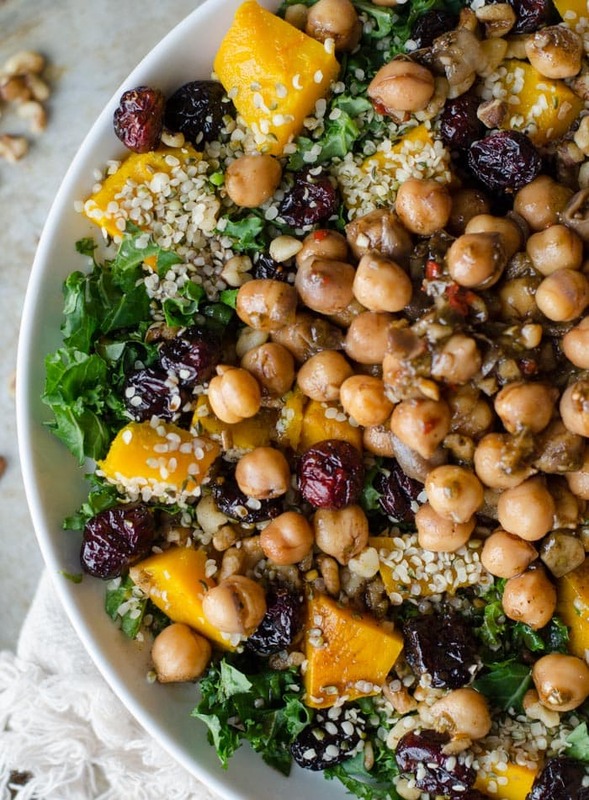 Plus, from the cranberries, to the hemp seeds, to the squash, this salad is rich in antioxidants, omega-3‘s, phytochemicals, vitamins and minerals. I decided to leave the kind of squash in this recipe up to you. I used kabocha squash because it’s my favourite but acorn, butternut or delicata would all work well in this salad. Which ever squash you choose the preparation method will be the same. There are a few different ways you can roast squash. You can roast them whole, seeds in and everything and then scoop the seeds out once they’re cooked. You can de-seed, peel and cube before roasting. You can de-seed and slice and roast it in chunks with the peel on, then remove the peel once it’s cool enough to handle after roasting. Since I used kabocha squash, I de-seeded it, sliced it into big chunks then roasted it at 400 degrees until it was tender. Once it was cooked, I sliced the skin off and cubed it to use in the salad. For butternut squash, I’d probably peel and cube it before hand and for acorn and delicata, I’d slice the peel off once cooked. They can all be roasted at 400-425 degrees for 20-40 minutes until tender and starting to brown. Butternut Squash. Butternut squash is probably the most common winter squash there is. It tastes nutty and slightly sweet and has a beautiful creamy texture. Butternut squash is quite easy to peel due to it’s thin skin, so preparation-wise it’s probably the quickest. Very high in vitamin A and C.
Kabocha Squash. As much as I love all squashes I have to say that kabocha is my favourite. It has the creamiest texture and sweetest, buttery flavour. I love eating it on it’s own or adding to soups and curries. Kabocha squash is shaped like a flattened pumpkin and is quite easy to handle. You may also come across red kabocha squash, which is very similar to green but even sweeter. Delicata Squash. Delicata squash is fairly small and is stripped in bright yellow, green and orange. It has a very thin, edible peel, which makes it convenient since there’s no peeling required. The flesh is creamy, nutty, slightly sweet and tastes a bit like sweet potato or butternut squash. Other winter squashes include spaghetti squash, pumpkin, red kuri, buttercup, sweet dumpling and hubbard, but I’d stick to the four I’ve listed for this particulate recipe. Any of these except spaghetti squash would work though. Squash of all kinds are a staple in my diet throughout the Fall and winter months. They’re naturally low in fat and calories despite they’re amazingly creamy, satisfying texture. Each squash has it’s own distinct nutritional benefits but as an example butternut squash is rich in vitamin A, B6, C, E, magnesium, potassium and manganese. Add texture. I like to add texture to my salads with ingredients like nuts, seeds, olives and dried fruit. It can also help to use a mixture of raw and cooked veggies. I’ll make homemade garlic maple croutons on occasion by tossing cubed, sprouted whole grain bread with a bit of olive oil, maple syrup and garlic powder and baking until crisped. Mix flavours. Think of ways you can incorporate sweet, salty, bitter, savoury and other flavours together to make your salads more interesting. I like adding a bit of something sweet like raisins, goji berries, cranberries, chopped dates or fresh fruit like apple, pear, berries or orange slices to balance out a nice, tangy dressing. Make your own dressing. Homemade salad dressings are easy and a healthy alternative to processed dressings. I love the balsamic vinaigrette from this salad, tahini lemon is always a good choice or try a simple sweet dijon dressing with olive, oil, lemon and maple syrup. Herb dressings are also easy. Use fresh herbs, water or olive oil, vinegar of choice, sea salt and lemon. Peanut or almond butter dressings are delicious too. Make it a rainbow. Red, green, orange and purple are are powerful colours. Think red peppers, strawberries, blueberries, tomato, sweet potato, carrots, squash, purple yams, black and purple kale, spinach and as many other richly colour veggies you can think of. These foods contain are the most nutrient-dense and are a good source of important cancer-fighting, immunity-boosting, heart health-loving nutrients such as folate, magnesium, potassium, fiber, and vitamins A, C and K.
Think outside the box. Salads don’t have to be boring and you can get really creative and have some fun making them. Try adding a scoop of whole grains or edamame pasta, mix lightly steamed veggies with roasted and raw, try preparing veggies different ways like grating them or mashing them, try different nuts and seeds like hemp seeds, pumpkin seeds, cashews, sunflower seeds, almonds and walnuts. 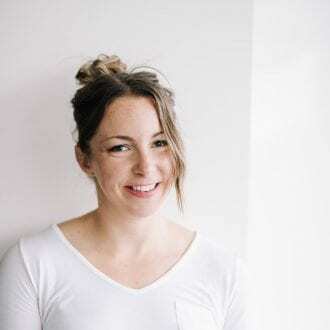 You may find my post on creating buddha bowls helpful. Add vegan parmesan. One of my favourite salad toppers is simple vegan parmesan made with nutritional yeast. Ah, marinated chickpeas. If you guys haven’t made them before, you gotta. 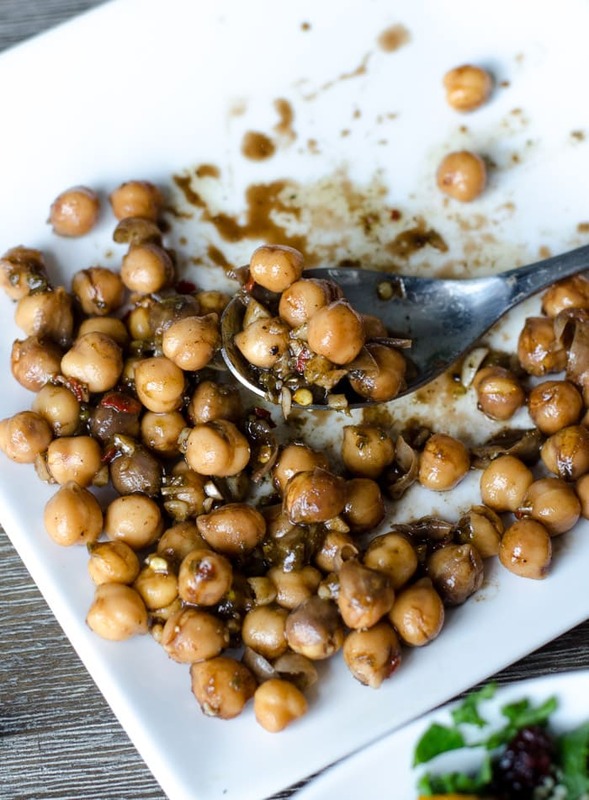 There’s not much too it, basically you mix up a little marinade and let those chickpeas soak away for the most flavourful delicious, little chickpeas you ever did taste. You can store marinated chickpeas in the fridge for up to a week and their flavour only improves over time. They can be enjoyed on their own or added to salads and other dishes. There are a lot of different ways you can marinate chickpeas, endless variations really, but my go-to ingredients are olive oil, garlic, salt, pepper, red wine vinegar, lemon and spices. For this recipe I used olive oil, salt, lots of fresh garlic, salt, pepper, chili flakes, oregano, thyme and balsamic vinegar. They taste amazing and I was snacking on them all week after making them for this salad. If you can, try letting them overnight for the best flavour in this salad! 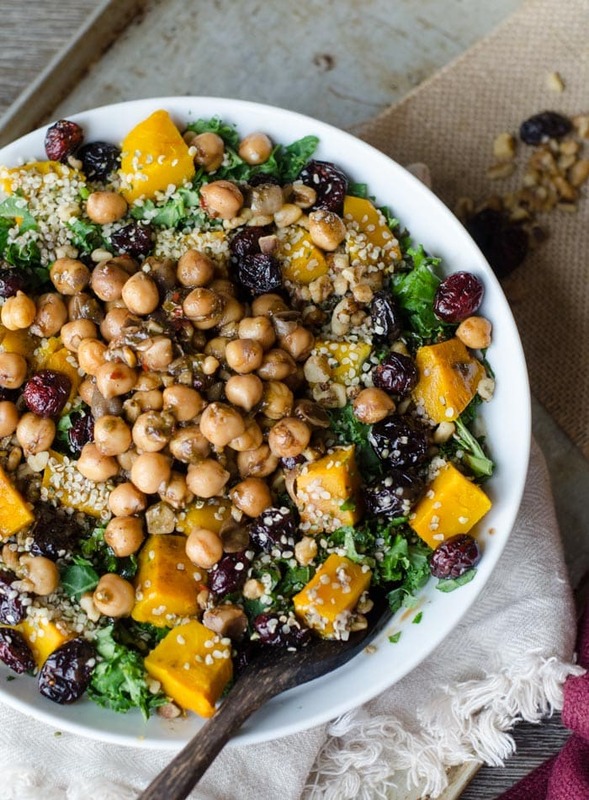 This aromatic, flavourful Fall harvest salad features perfectly roasted butternut squash, nutritious kale, soft and chewy dried cranberries, crunchy walnuts, marinated chickpeas and a tangy balsamic vinaigrette to bring it all together. This is the same balsamic vinaigrette I used in my Roasted Potato Kale Salad which is another outstanding salad you should definitely check out. The reason I use kale in salads so often is that it keeps well as opposed to soft greens like spinach or arugula. You could also use swiss chard for a green that will hold up well if you have leftovers. If you don’t plan to have leftovers, you could use a softer green such as romaine lettuce, iceberg lettuce, watercress red leaf lettuce, arugula, spinach or a mix of field greens. I like kale best for it’s sturdiness, if that makes sense! Basically it holds firm without wilting and getting soggy, and there’s nothing worse than soggy salad…so choose wisely! I would recommend going with kale if that works for you. If you prefer to watch a video of this recipe, watch below as I make it from start to finish! 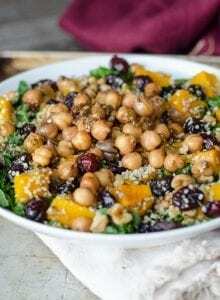 This Roasted Squash Salad with Marinated Chickpeas essential omega-3 fatty acids from the hemp seeds and walnuts, antioxidants from the kale and cranberries and plenty of other nutrition from each ingredient in it. It’s vegan, gluten-free, nutritious, satisfying and with all the different flavours and textures, it tastes incredible. Place all the ingredients in a container or bowl and mix them up. Place in the fridge, covered for at least a few hours up to overnight. The longer, the better! Whisk all ingredients together in a small bowl or container. Place the finely chopped kale in a bowl and massage with a tiny drizzle of olive oil and if desired, some fresh lemon juice. Let that sit for 5 minutes. Add the roasted squash, hemp seeds, cranberries, walnuts and chickpeas. If you don’t feel like making balsamic vinaigrette, I’ve made this salad drizzled with just balsamic vinegar and some of the extra marinate from the chickpeas and it was still delicious. I used kabocha squash in this recipe, which I roasted in slices then chopped the peel off once it was cooked. I would recommend using butternut, kabocha, acorn or delicata squash. 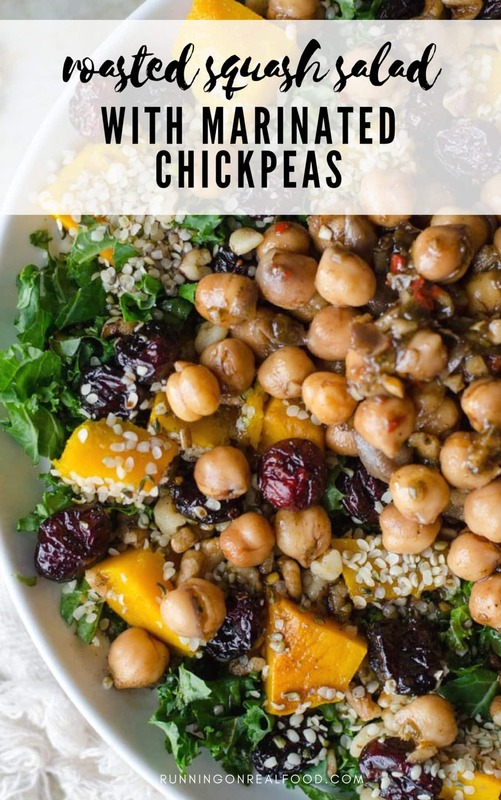 The chickpea and dressing recipes make enough for about 4 salads, adjust the amount of veggies and salad ingredients as needed. Beautiful photos! And I’m right there with you about the kale and Swiss chard; if time allows, I will rub mine with olive oil and/or lemon juice to wilt it slightly and so the vegan parm will have something to stick to. Thanks for sharing! Same here, I noted in the recipe to give it a quick rub with olive oil and lemon! Thanks for your comment. Thank YOU! Absolutely delicious! My family of 5 loved it this evening!!! So colorful too!!! Yay!! That’s awesome. I don’t get too many reviews on salads during the colder months so I’m so glad you made this. 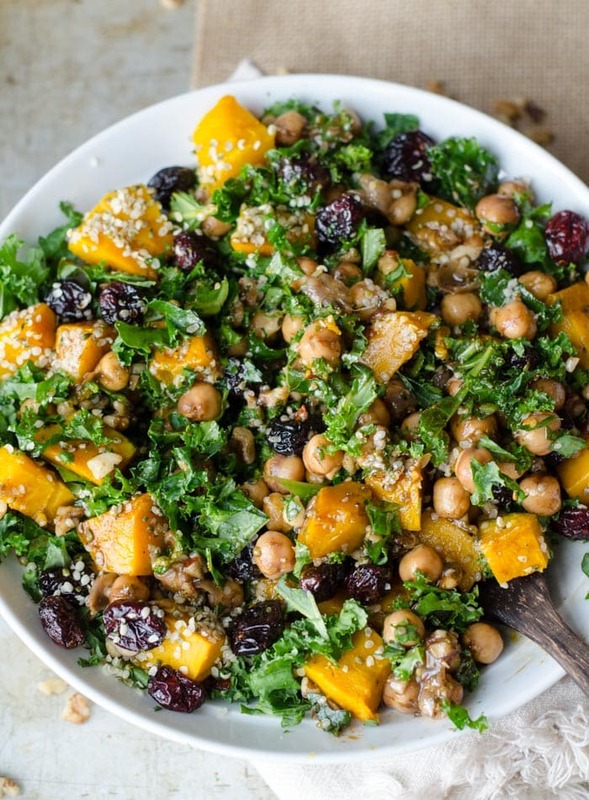 It’s such a good Fall/Winter salad. Thanks for the comment!